How Rich Is Davao-Based Entrepreneur Dennis Uy? The listing of Chelsea Logistics Holdings Corp. on August 8 caps more than a year of frenzied mergers and acquisitions as well as fresh ventures for Dennis Uy, the emerging Davao-based tycoon. The 43-year-old entrepreneur first rose to national prominence after he founded and grew Phoenix Petroleum into one of the country’s major independent petroleum retailers. Uy is also known to be personally close to President Rodrigo Duterte, donating Php30 million to the latter’s campaign in the 2016 presidential polls. A diversified shipping company that transports both passengers and cargo, Chelsea Logistics is the third publicly listed company owned and controlled by Uy. He founded Phoenix Petroleum, which was listed in 2007, and acquired a large stake in already-listed shipping company 2GO Group Inc. in April 2017. Chelsea Logistics’ listing added around Php13.5 billion to the market value of Uy and his immediate family’s holdings in publicly listed companies they also control. 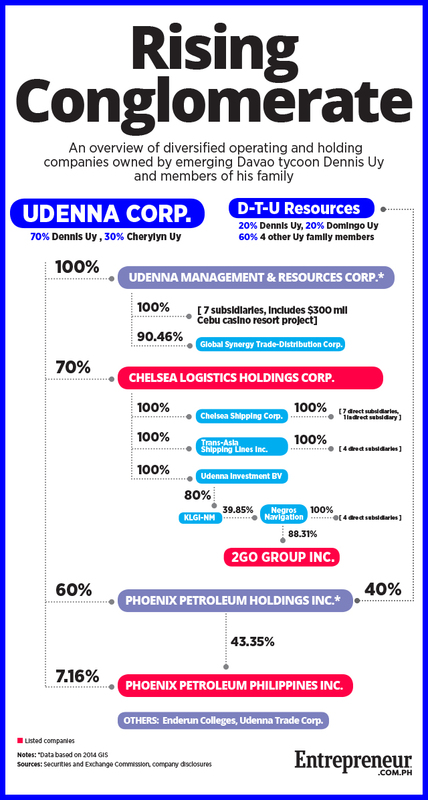 Udenna Corp., which he owns with his wife, controls 70 percent of Chelsea Logistics after the IPO. The other 30 percent will be held by the public. Closing its first day of trading at Php10.56 per share, Chelsea Logistics has a market capitalization of Php19.2 billion. Already, he and his immediate family’s holdings in Phoenix Petroleum Philippines Inc. has a market value of Php8.5 billion, roughly half of the listed oil company’s total market capitalization of Php16.4 billion. Uy’s Udenna Corp. has a direct 7.16-percent stake in Phoenix Petroleum. In addition, another 43.35 percent is held through Phoenix Petroleum Holdings Inc., which is 60 percent owned by Udenna Corp. and 40 percent by D-T-U Resources, a holding company owned by Uy, his father and other family members. Phoenix Petroleum is one of the largest independent oil companies in the country, where Uy serves as president and CEO. As of end-2016, it operated over 500 retail gasoline stations all over the Philippines and controlled 5.7 percent of the market. Phoenix Petroleum also made the news last May with its planned acquisition of Petronas Energy Philippines Inc., a local unit of the Malaysian oil and gas conglomerate Petronas. The acquisition was approved by the Philippine Competition Commission this August. When Phoenix Petroleum celebrated its 10th listing anniversary last month, no less than Duterte came to join the celebration, the first time a Philippine president attended such an event. In his remarks, the President narrated Uy and the company’s humble beginnings in Davao City, underscoring Uy’s close relationship with Duterte. As well, Uy’s indirect holdings in listed 2GO Group has a market value of Php11 billion, or about 20 percent of the shipping group’s market capitalization of Php55.8 billion. Uy’s stake in 2GO Group are held indirectly through Chelsea Logistics, which owns 80 percent of KLGI-NM, which, in turn, has a 39.85-percent stake in Negros Navigation Co. The latter owns 88.3 percent of 2GO Group. 2GO Group Inc. has over 24 vessels and 2,900 retail branches around the country. Last April, Uy was appointed as president and CEO of 2GO Group, and he confirmed in a press conference during Chelsea Logistics’ listing ceremony that he is planning to increase his stake in the 68-year-old company. Adding the market value of Uy and his immediate family’s stake in Chelsea and Phoenix Petroleum yields a total of Php22 billion. (The value of his indirect interest in 2GO is not included because it is already part of Chelsea’s market valuation). While a portfolio of three listed companies is already impressive, Dennis Uy’s business empire doesn’t stop there. The businessman will also develop an integrated resort and casino in Lapu-Lapu City in Cebu. Called the Lapu-Lapu Leisure Mactan, the 12-hectare development was approved by the Philippine Amusement and Gaming Corp. last May and is valued at $341 million, just about a third of the minimum $1 billion required for each of the four integrated resorts located at the Entertainment City strip along Manila Bay. The project is listed under a real estate subsidiary, Udenna Development Corp. (UDEVCO), and is slated to be completed by 2022. Last July, he completed his acquisition of Enderun Colleges Inc., which runs a private college in Bonifacio Global City. While the size of his stake was not specified, Uy acquired the company through Udenna Corp. Check out the infographic to see more details on Dennis Uy’s major companies.